For many of us, as we chronicle the timeline of our craft beer journey, a lot of the same names jump out as playing a pivotal role for many us: Sierra Nevada…Stone…New Belgium…sometimes these names will reveal the geographical region where someone “grew up” in their beer life. For me, one of those names is Upland Brewing. Most of my growth time was spent in Indiana, and I’m grateful to have Upland to thank for opening my eyes to quality *and* local craft beer. Given my growth journey over the last 6+ years, I find it interesting how ubiquitous I still view “Indiana Beer” with “Upland” as a brewery. Upland isn’t the only, nor is it the first brewery in Indiana, but it still rings out as the one most important to me. During my most recent trip back to my home state, I was fortunate enough to visit the Upland brewpub. Open since 1998, it now is home to the main sour production facility. 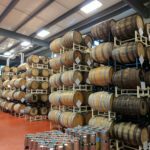 Upland’s “clean beer” facility is a few miles away, and so only sours are produced in this facility, which goes a long way to prevent cross-contamination. Upland has been producing sours here at the brewpub since 2006, and will ferment their creations from 3 months all the way to 3 years, depending on the particular result they’re looking to achieve. 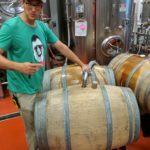 As Pete is showing us around, the sweltering Indiana summer’s heat and humidity are enough to melt the faint of heart, but we press on, and he talks about how Upland builds a sour beer base (Basis) that is the heart of their entire sour program. Basis is literally used as the base for the majority of their fruited sours. It’s especially interesting (to me, at least) that they bottle and sell the Basis by itself; I brought one of these bottles back (check episode 184) and we had it along with a dry-hopped version of the same beer called Hopsynth. I find it extremely compelling to purchase and sample the base beer and then the tweaked version side by side. I’m kicking myself for only bringing the single bottle home with me, but I brought back so many delicious beers that I had to draw a line somewhere! 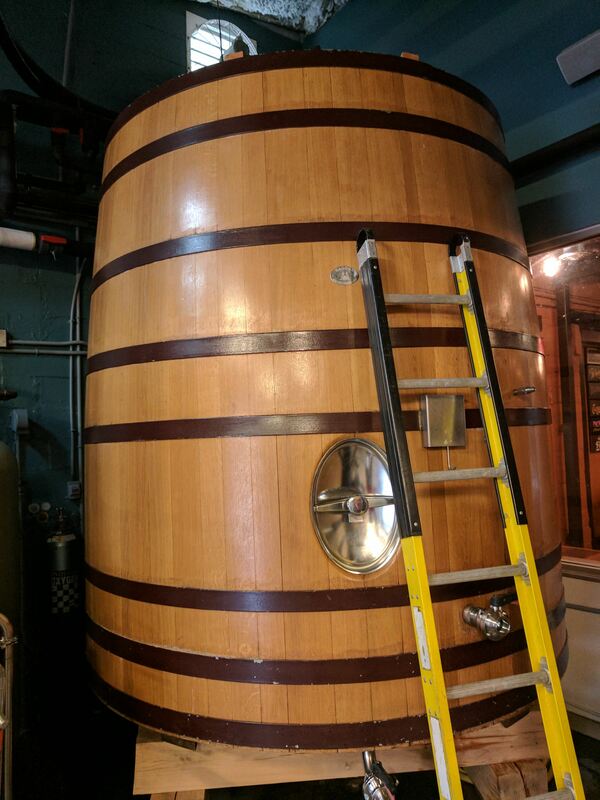 After the sour base is created, it’s pumped under the parking lot to the relatively newly opened “Wood Shop” next door, which contains some of the tallest foeders that I’ve ever been close to in person. 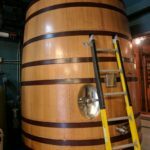 The name of the Wood Shop has historical context, as the area in which you will find the brewpub was formerly the Bloomington wood and mill industrial areas. This is a place for innovation and quality. 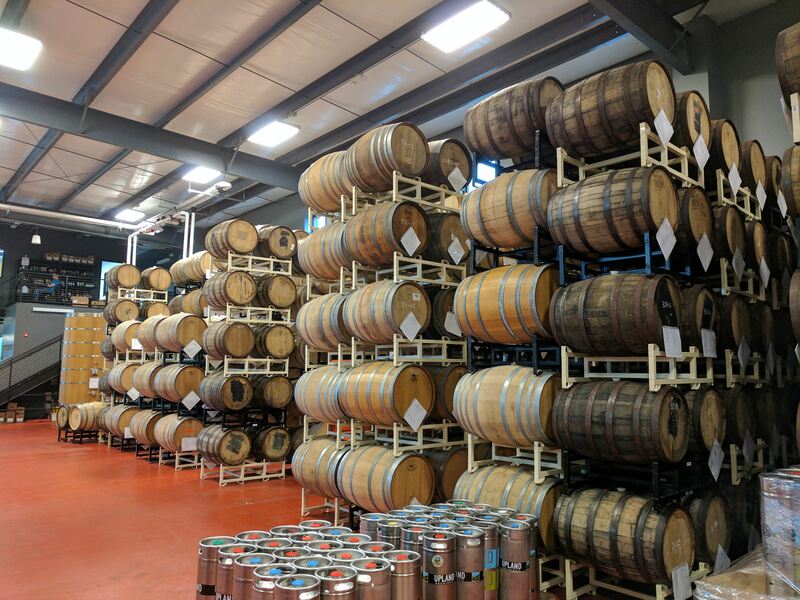 There are racks and racks of different barrels lining one wall. Many are wine, some are spirits. Upland will frequently collaborate with Oliver Winery (a short few miles away), and the sharing of barrels has paid off well for their wine-influenced sours, which I strongly recommend. (so as to end up with a consistent product). 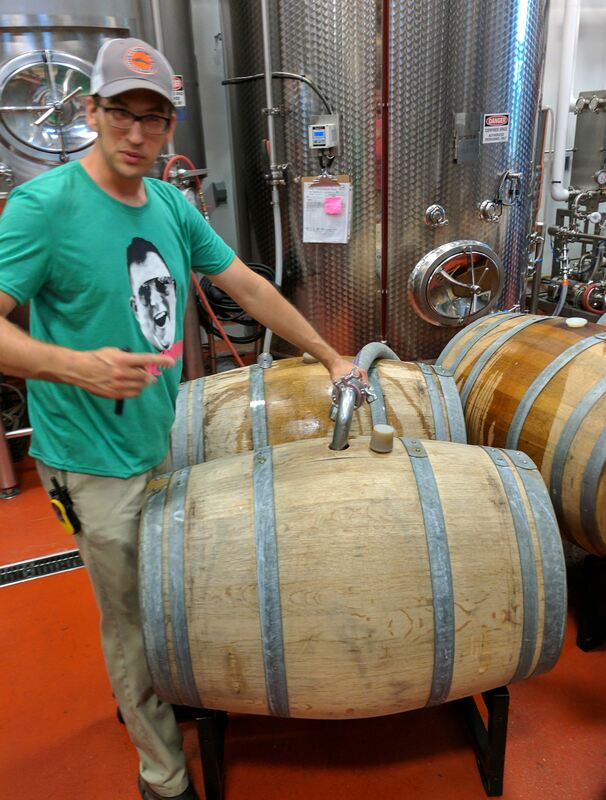 Pete explains that the notion of blending (in this case, between tanks), “It works in art, and it works in beer.” Once the blending is complete, it is fruited and aged for at least 3 months before being bottled. 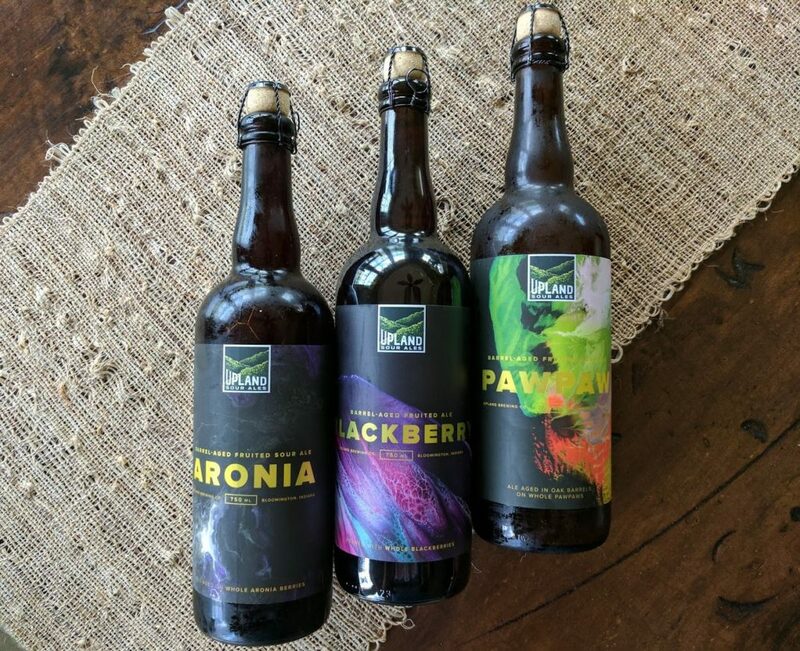 We’ve carried Upland sours on the show many times (Dantalion on Ep124, Blackberry on Ep99, Malefactor on Ep74, and Raspberry on Ep71), and they’ve always been well received. Blackberry made the top 5 of 2015 list for both myself and Chris, and Dantalion was tapped by 4 of 6 of us! Next story Episode 188 – Huh? What?